The Slidavan is an easy to build lightweight telescopic caravan which does it all. On the road its light weight and compact dimensions means you'll hardly know you are towing it. At the campsite it takes just a minute to turn it in to a fully insulated and very comfortable 2 berth caravan with full standing headroom throughout. 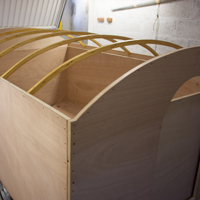 No special skills or materials are needed to build a Slidavan and you don't need much space either as a Slidavan can be built in one car garage. The bright and airy Slidavan interior looking aft. On the left is a sink and two burner hob. Opposite the space is left open so it could be used as a shower or storage. 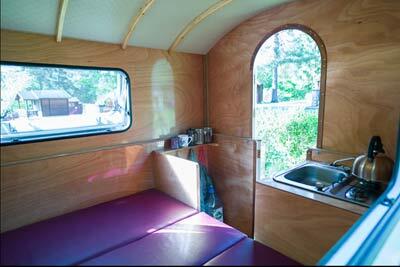 Note the back cushions dropped down between the bunks to create a very wide and comfy double bed. The interior on this Slidavan is lit by a strip of LEDs tucked behind the front beam. The front panel is painted white to reflect the light but also so it can used as a 60" projector screen! 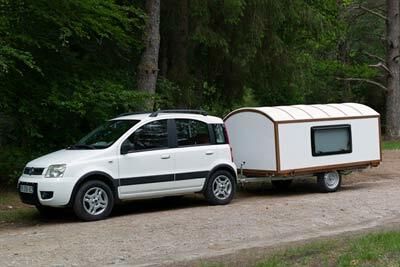 Here the Slidavan is attached to one of the smallest cars on the road, a 1.2 Fiat Panda. The Slidavan in road mode is barely wider and no higher than the tow car. Tucked in like this there is hardly any resistance and being so light fuel consumption is barely affected. Since the Slidavan is no wider than the tow car, if the car can get through a gap, so can the Slidavan! What makes the Slidavan special? The Slidavan is a lightweight 2 berth telescopic caravan designed to fit on a small unbraked trailer with a gross capacity of 500 kilos. The Slidavan weighs about 300 kilos unladen and can be towed by the smallest of cars. 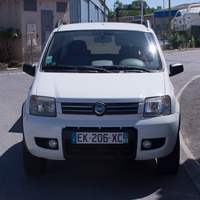 For example, one of the smallest cars on the road, a Fiat Panda 1.2 has a towing capacity of 400 kilos giving a very respectable payload of 100 kilos. The Slidavan is fully insulated and has a full six foot of headroom throughout, two wide single berths or one large double. The roof can be raised in less than a minute. 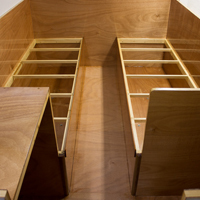 The step by step illustrated instructions walk you through the entire build process. They include a lot of further information on all aspects of the build, from the materials you need and how to find and modify them. Unlike a traditional caravan, the Slidavan is constructed using the insulating layer as a structural element. This creates an extremely light but very strong structure. You do not need much space to build a Slidavan as the panels are made using the floor panel as a work surface. A Slidavan can easily be built it just a one car garage. The Slidavan plans are metric but allow for the use of Imperial materials. The length of the Slidavan is based on the size of a sheet of plywood. No special materials or skills are needed to build a Slidavan but it will take about 200 hours to make one. If you buy all new parts to build your Slidavan it may cost about £3000 which is a fraction of the cost of other small caravans available to buy today. The costs can be brought down considerably by using second hand parts. 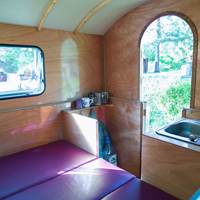 The bright and spacious interior consists of two settee bunks wide enough to sleep on or by simply dropping in the seat backs, a very wide double bed can quickly be made. There is a good sized table which bolts to the front panel. At the rear of the Slidavan there is a kitchen area with room enough for a small hob and sink. The other side is left open so you can decide how to fit it out. It could be used for a shower or simply as a place to stow extra things when camping. Although the Slidavan is not very aerodynamic it really doesn't matter because its compact size when in road mode means that it is mostly tucked in behind the tow car and offers very little resistance. The Slidavan is actually attached to the car on the left although it's almost impossible to see! Being so light as well means that you will hardly notice it. Under most circumstances you can drive just as fast as you would without it attached. The only time you need to slow down is going over speed bumps as the suspension on most trailers is very rudimentary and doesn't have much movement. Fuel consumption is barely affected. 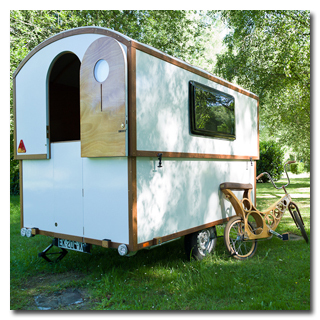 The best thing about the Slidavan is the fact that it is a trailer, not a caravan. It needs no special insurance, registration or licence to tow one. So long as you stay below the towing weight limit of your car and fit the right lights, reflectors and a number plate you're good to go. This applies in Europe, laws may be different in your country so check first! Q: How long will it take to build my Slidavan? It will take about 200 hours to build a Slidavan. It is not a quick build. There are a lot of materials in it, 20 sheets of ply, 1000 screws and 15 litres of glue for example but it would make a great winter project. Q: How much will a Slidavan cost to build? Always a very subjective question but if you bought only new parts you might expect a Slidavan to cost about £3000 to build but the cost could be reduced dramatically using second hand parts. Q: Do you sell a Slidavan kit? Sorry no, the Slidavan is only available in plan form. But don't let this stop you! All you need is easily available and no special skills are required. Q: How much weight can a Slidavan carry? This depends on your car's towing capacity and how lightly you build your Slidavan. Expect a Slidavan to weigh about 300 unladen so even with a small car you still have a respectable pay load of about 100 kilos. Q: The plans are metric can I build a Slidavan using Imperial materials? Yes you can. The Slidavan will still have to be built using metric measurements and it may be a couple of inches shorter. All the info you need is in the plans. Q: What are the legal requirements for a Slidavan? 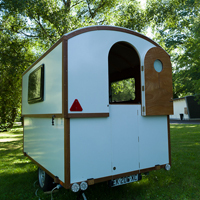 Because the Slidavan weighs less than 500 kilos it is considered a trailer in Europe. Laws may differ in other parts of the world so check first. Q: How much does a Slidavan weigh? An unladen Slidavan will weigh about 300 kilos including the trailer which makes it one of the lightest caravans in the world. Q: How does the lifting mechanism work? Q: How well does it tow? The Slidavan is very easy to tow. A small tow car will notice the weight when pulling away and going up hills but other than that you'll hardly know it is there. It is hardly any wider or higher than the tow car so if the car can get through a gap, so can the Slidavan. No special mirrors are needed. Q: Is it hard to manoeuvre? Not at all but with the Slidavan there's really no need to even try. It is much easier to simply unhitch it and move it by hand! Q: I don't have any woodwork experience, can I still build a Slidavan? Yes. 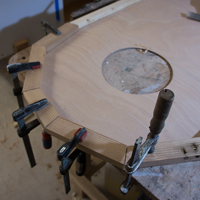 If you can follow instructions, have a few basic tools and are willing to 'have a go' the plans will walk you through every single step of the build. 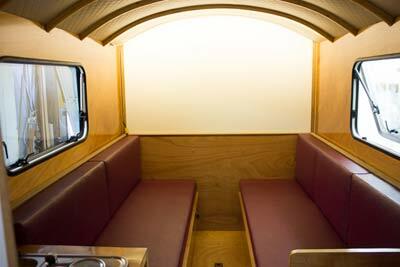 From wood selection to the finished caravan. There is nothing difficult about building a Slidavan. It just takes some time. The metric Slidavan plans have over 100 pages and more than 250 photos and even bonus sections full of useful information. The plans come as a PDF file and are about 15 mb in size. The Plans can be downloaded immediately from this site after you pay for them. Upon completion of your payment you will be sent an email with a download link. Save the plans to your hard drive.